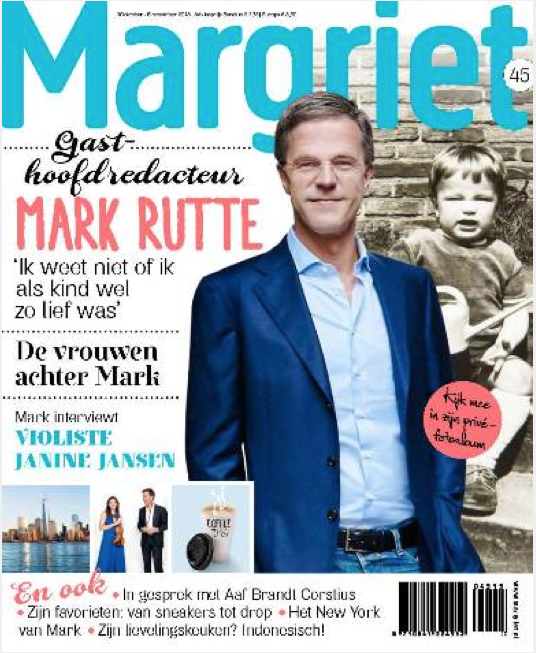 Last week, women’s magazine Margriet published a special issue devoted to the Dutch prime minister, who was the latest in a long line of illustrious guest editors. Who is he and does his eternal smile hide a perhaps even jollier personality? And why is he still single? Here are 10 things we now know about Mark Rutte. 1 Mark Rutte is one of seven – his oldest (step) brother is 35 years older than him. He was a fractious five-year-old and, rumour has it, he still has a bit of a temper. This is denied – calmly – by the prime minister who says he only ‘slams the door twice a year and then pokes his head around to say sorry’. 2 Mark Rutte does not have a ‘teflon layer’ which allows him to shrug things off, no matter what his political opponents throw at him. Rutte says he is just as sensitive as the next person. 3 Mark Rutte is a ‘happy single’. When asked about the conspicuous absence of a significant other in his life, the prime minister says he might have ‘a wife and kids’ one day. But not just yet. ‘The most important thing to ask is “am I happy with how I live at the moment?” And I am,’ he says. 4 Rutte says he will not be a politican forever. He spent 10 years in industry before going into politics and now spends one morning a week teaching Dutch and Civics at a nearby secondary school. 6 Mark Rutte’s favourite film is Milos Forman’s Hair from 1979. The film – about the Vietnam war – was made when he was twelve but Rutte was a precocious boy who started becoming interested in politics at a young age. 7. He uses an old Nokia to send text messages, blaming his big thumbs for making it hard to use a smart phone. 8 His favourite television programme is De Wereld Draait Door, the daily tv chat show hosted by Matthijs van Nieuwkerk, on which he has been a guest on occasion. 9 Mark Rutte’s favourite classical music include Mozart’s String quartet no 4, part 1 ‘Allegro’, Brahm’s clarinet quartet, opus 115 – part II, ‘Adagio’ and Franz Schubert’s ‘Gute Nacht’. 10. But when it comes to something more modern, you might find him belting out U2’s Beautiful Day or Uptown Funk from Mark Ronson, featuring Bruno Mars. Previous Margriet guest editors have included princess Laurentien, Marco Borsato, Job Cohen and Jamie Oliver.